Alternatively Please phone 02 4872 4222 for more advice on which kit best suits your needs. Over bar / Sub Mount or Sub mount Rubber Kits are generally in stock for current models and can be ordered weekly for old models also. We have a huge range and our crew at Dirtbike have built bikes which have won Finke 4 times outright / Australian Safari 7 times outright / Condo 750 9 Times outright. 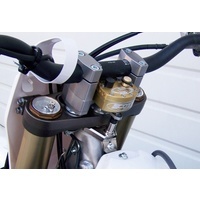 So we have used Steering dampers and can advise pro and cons of each mounting style.